Does the G stand for Goodguy? AUTO [V/R] GB1: [SB1, choose 1 of your other rear-guards, and bind it face up] At the end of the battle this unit attacked a vanguard, you may pay the cost. If you do, choose 1 of your opponent’s rear-guards in the same column as this unit, and your opponent puts that unit on the bottom of their deck. 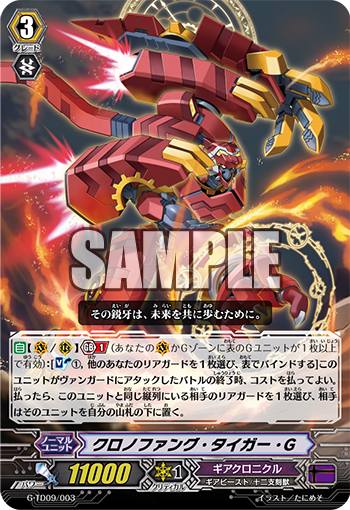 AUTO [V]: [CB1] At the end of the battle this unit attacked a vanguard, you may pay the cost. If you do, choose 1 of your face-up grade 1 or higher units in the bind zone, and either add it to your hand or call it to R.
Today we’re introducing from the Trial Deck “True Zodiac Time Beasts” (on sale September 30th, 2016), a 《Gear Chronicle》 G4 Unit “Metapulsar, Huanglong” and a different named Chronofang “Chronofang Tiger G”! • You can Call a Grade 1 or higher card from your Bind Zone. If one of your Sentinels is in your, you can add them to your hand to Guard. If you need a Unit that greatly increases its Power like “Steam Maiden, Melem” or “Upstream Dragon”, it’s perfectly fine to Call them after that attack. Before you Stride with this Card, remember to fill up your Bind Zone. “Chronofang Tiger G”, at the cost of Binding an Ally Unit, can send an opponent Unit in the same Column to the bottom of the Deck! If you combine it with Units whose effects activate in the Bind Zone, you can nullify the negatives of Binding, and you can place a particularly troublesome enemy Unit back to the Deck. And since it has the “Chronofang” name, it gets even stronger in Chronofang focused Deck. The 4th Clan Booster, “Gears of Fate” which goes on sale the same day, includes various cards that work well with both Huanglong and Chronofang, so be sure to keep an eye on further information as it becomes available!